Box just recently released new iPhone and iPad applications, and, as part of the release, is offering 50 GB of free cloud storage to users who download the new apps within the next month. Given that Box’s free tier is 10 gigabytes, the fresh file space is large in comparison. The updated applications sport a new user interface, preview support for more than 100 file varieties, commenting and text search, among other upgrades. What Box has in mind is simple: It wants its mobile applications to be your hub for file storage, file management, and collaboration on the go. This mirrors its efforts on the web to expand its tool set past file storage and up the value stack with applications like BoxNotes that let users edit their stored documents. If you have used Box in the past or do not use it that often, here are some of the changes they made. While I typically use Dropbox and Skydrive… but 50GB is a good amount of free cloud storage. Resizing one image is pretty easy, even resizing multiple images is fairly easy/simple for most people. But for some people it can be either difficult or time consuming. VarieDrop helps with this issue. 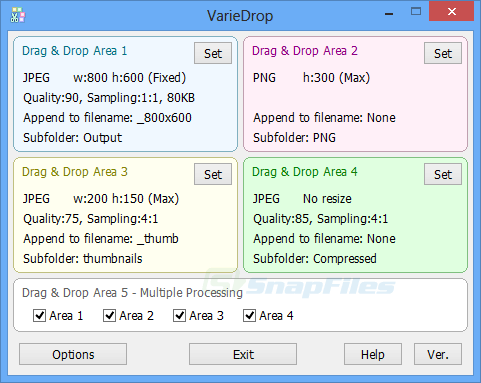 VarieDrop tries to simplify this by allowing you to define up to four “drag and drop areas”, each of which have their target size, file format, output folder and so on. Once it’s set up, just select your target images, drag and drop them onto that area, and they’ll be converted and resized accordingly. There’s also a fifth “drag and drop area” which can optionally combine the results of the others. If you’ve set up the main areas to create 320×200, 640×480, 800×600 and 1024×768 images, you might also have this fifth area generate all four sizes with a single drag and drop. VarieDrop has some limitations. There is no watermarks, special effects or rotation. It just allows you to resize to a few standard sizes and changes your image to other common image formations. VarieDrop’s ability to perform these operations on multiple files with a drag and drop does make the program very easy to use, though, and if your batch processing needs are simple then the program could be worth a look.